"I highly recommend Jim and his work. It’s good to have someone like him and his vast marketing experience and knowledge equip my company for success." CUSTOMERS. CLIENTS. PATIENTS. LEADS. REVENUE. Are you talking to the right people at the right time with the right message? Our book, Marketing Matters, will help you grow and expand your business by building a solid marketing strategy. or get if for FREE! The difference between helping and selling is just two letters, but those two letters mean all the difference today in marketing. During the 2018 ALIGNMENT West Virginia’s Small Business Conference, I was asked why I give so much of my marketing and advertising knowledge away for free. The person asking the question was referring to my weekly column in The State Journal, weekly blog, another marketing book, free content on social media and so-on. I guess my best answer to that is that I love serving people and helping them. When it comes to business, I’ve had the opportunity to learn from some of the best leaders in business. Not only in West Virginia, but from across America. These leaders shared their knowledge freely with me because I wanted to learn and better myself, and they helped me in my journey. So, I feel an obligation to share what I know with others who are interested in learning. If people need my help AND are interested in my help, I help. In his book YOUTILITY, marketing thought leader Jay Baer talks about the concept of Youtility - not utility - as "marketing upside down." He coined “Youtility” to describe marketing that is "wanted" by customers. I refer to it as "marketing that people love." What do I mean by marketing that people love? That's easy. Marketing is all about informing, educating and providing value in the brand/consumer relationship. It's about creating and providing useful, FREE information or content that creates long-term trust and a friendship between a company and their customers. A side benefit from this marketing philosophy is that if you produce content that is valuable, relevant and FREE then you become a subject matter expert. You, in essence, become an authority in your particular space. If you know me - you know that I really love to fish. I'm an angler. A fisherman. Some would say I'm obsessed with fishing. One of my LinkedIn followers sent me a message wanting to know how to attract more customers. He is a commercial lender at a large financial institution. The advice I gave him was the same message: Add value, help people, and educate them. They will eventually become customers - for the long term. We have to understand it is NOT about selling. As a lifelong media professional, it is amazing to me how rapidly the media landscape changed. Forever. The days of "selling" as a marketing strategy are near the end. The new frontier (especially the past six years or so) of inbound, permission-based, value marketing are here to stay. It’s all about the content you deliver to HELP YOUR CUSTOMERS. So, when you wonder, "Why does Jim give so much information away for free?” I hope you now have a better understanding of why. Giving away useful, how-to marketing information is how I've built our company. I believe it's how we'll continue to grow and prosper, too. 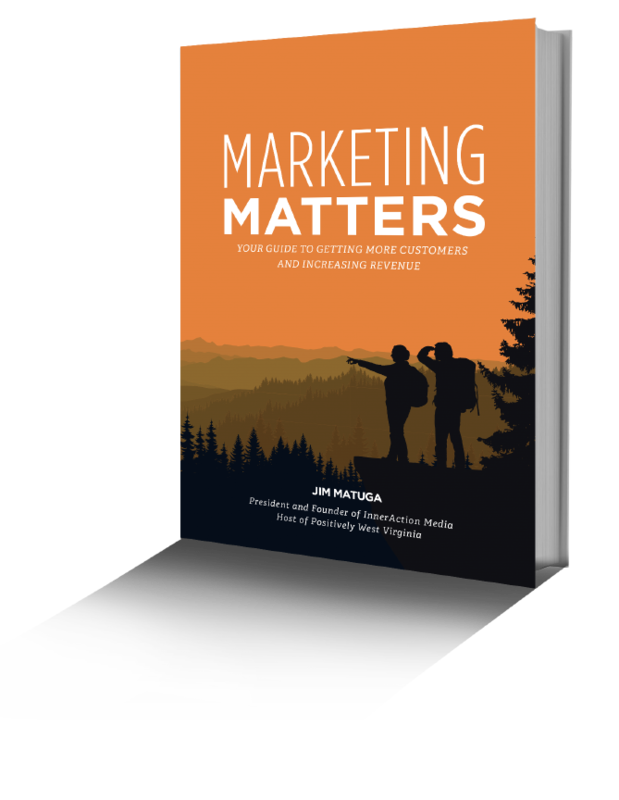 This book, Marketing Matters, was written to guide you on your marketing journey, and I hope it provides you with great insight into how to build your company!